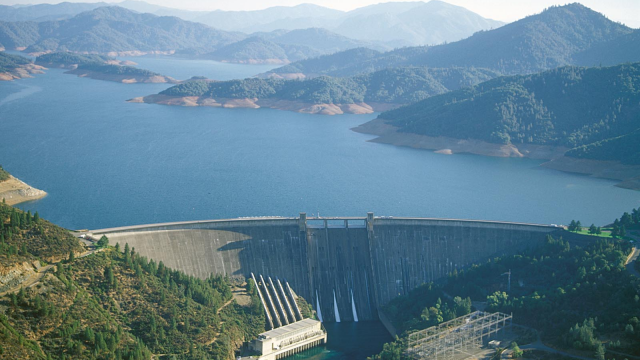 Shasta Lake is the biggest reservoir in the state. (Bureau of Reclamation). The U.S. Bureau of Reclamation, which operates the dam, held a series of public meetings in Redding, Sacramento and Los Banos on the controversial plan this week. Supporters say that the expansion is a cost-effective way for our thirsty state to increase its water storage capacity, but not everyone's convinced it's worth it. Members of the Winnemem Wintu tribe have historical ties to the land, and don't want to see their sacred sites destroyed by flooding waters. Environmental groups worry about salmon runs, habitat loss and impacts to the Sacramento-San Joaquin Delta. Most of the land surrounding the lake is federal, but some nearby landowners have expressed opposition to enlarging the reservoir. Steve MacNeil owns property in Lakehead, a town near the lake. He says local businesses along the shoreline are concerned that the government might flood their land without adequate compensation. The Bureau of Reclamation is accepting public comments on its draft environmental impact statement until the end of September. In August the Bureau plans to announce another series of public meetings. A final report is scheduled for completion sometime next year. Ultimately the project requires Congressional approval, which, according to the Bureau of Reclamation, is unlikely to happen before 2016.